10 Central Valley counties for the Regional Conservation Partnership Program (RCPP) – Rice Stewardship Partnership, sponsored by Ducks Unlimited in partnership with USA Rice Federation. Other local partners include the California Rice Commission, Northern California Water Association, and numerous regional water districts. The Rice Stewardship Partnership RCPP seeks to provide financial and technical assistance opportunities to rice producers to help improve the efficiency of irrigation water use and minimize water quality impacts in California’s Central Valley, while also benefiting wildlife. This special RCPP Rice Stewardship Partnership funding is available to eligible California rice farmers in Butte, Colusa, Glenn, Placer, Sacramento, San Joaquin, Sutter, Tehama, Yolo, and Yuba counties. Conservation Stewardship Program (CSP) – Applications must be received by 2 March 2018. Environmental Quality Incentives Program (EQIP) – Applications must be received by 6 April 2018. Because rice is 100 percent irrigated and having adequate supplies of water is fundamental to production, the Rice Stewardship Partnership’s main priority is increased water quantity. The secondary priority for the partnership is improved water quality, specifically improving on-farm production that will maximize fertilizer uptake, minimize nutrient losses, and prevent pesticide losses on working rice fields. 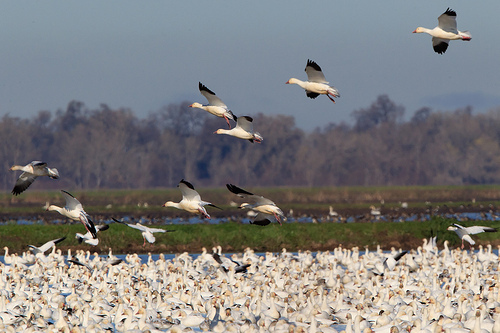 The improvement of water quantity and quality will also help provide habitat and nourishment for approximately seven million ducks and geese migrating along the Pacific Flyway each year. Ducks Unlimited Inc. is the world’s largest nonprofit organization dedicated to conserving North America’s continually disappearing waterfowl habitats. Established in 1937, Ducks Unlimited has conserved more than 13.6 million acres thanks to contributions from more than a million supporters across the continent. Guided by science and dedicated to program efficiency, DU works toward the vision of wetlands sufficient to fill the skies with waterfowl today, tomorrow and forever. For more information, visit www.ducks.org<http://www.ducks.org>/ricestewardship. Since its inception in 1935, NRCS has worked in partnership with private landowners and a variety of local, state and federal conservation partners to deliver conservation based on specific, local needs. Please visit www.ca.nrcs.usda.gov<http://www.ca.nrcs.usda.gov/ for more information about NRCS.